I’ve always loved Halloween. I really enjoy watching excited children dressing up as their favorite super hero, cartoon character or whatever their imagination can dream up. Whether you have children you plan on taking out trick-or-treating, or your plans are to just stay in to give out candy to the neighborhood kids, your pets need to be kept safe. If your dogs are anything like mine, they get really excited by visitors knocking- or ringing the doorbell. Halloween ranks closely behind the 4th of July for pets going missing, since the front door is always opening and closing. Curious, excited pets can easily sneak out the front door, despite your best efforts to keep them inside. We suggest taking your pets to a quiet room in the house, with their crate (if they’re accustomed to staying in it). Give them their favorite toys, or a chew to keep them occupied for the few hours while trick-or-treaters collect their bounty. The next major issue, of course, is the candy. If you’re not aware, chocolate is toxic to dogs. In all of the excitement, especially with children- it’s easy for a sneaky pet to get into the Halloween candy. Make sure your kids understand that candy is not to be given to your pets, as the results can be catastrophic. If you’re planning on taking your dog on their evening walk on Halloween, please do so with caution. Most dogs love people, but they can become easily startled by kids (or adults) in costume. I recently was walking my Labrador, Archer through our neighborhood. As we passed by a well-decorated yard, he was scared by a life-sized Frankenstein. I mean, freaked out. That ended our walk. It’s hard to say how your pet may react to decorations, or kids in costume- but if your pet becomes scared, they may bite, escape or worse. Consider walking your pet before the sun goes down, if possible- or skip the walk altogether. 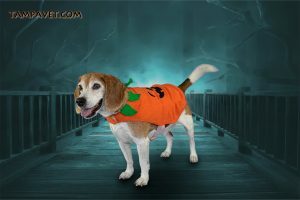 It’s hard to resist the urge to find a great costume for your pet. Keep in mind that not all pets enjoy playing dress-up. If you have a costume for your pet, there are some tips that are helpful to keep them safe. they may have a hard time breathing properly. Avoid costumes which may cover their eyes or limit the movement of their mouth. If they can’t see properly, they may become afraid, or aggressive. It’s always a good idea to do a test-run with the costume, days before Halloween, to see how your pet reacts. Let them wear it for a few hours to see how they adapt. If they hate it, they’ll let you know. If they hate the test-run, they’ll still hate it on Halloween. Keep an eye on your own costume, too. Make sure that there are no loose items, such as buttons, beads or other baubles that can fall off and become choking hazards. We love Halloween so much, we host our own party at Tampa Vet each year. If you missed the party this year, check out our photos from the event here. 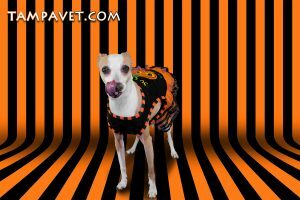 We wish you and your pets a happy and safe Hallows Eve.